Often getting updated is the Farm Heroes Saga game with 910 levels to complete, but this game does not come without its issues. Problems with Farm Heroes Saga include loading, crashing frequently as well as error codes popping up such as the recent error 919. 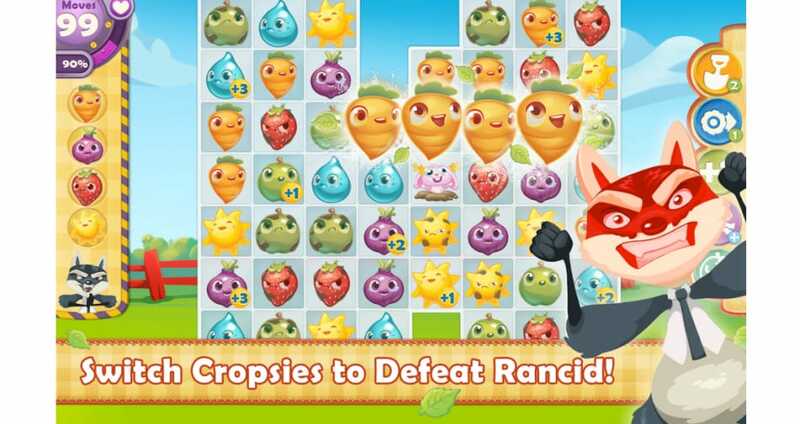 The most popular game by makers King is none other than Candy Crush Saga, but since they have released Farm Heroes Saga, which has the same concept but this time with animals such as Rancid the Raccoon. All gamers need to do is match three or more cropsies to keep Rancid away from the crops. A farm with mixed fruit and crops; even though this is a free-to-play game it does contain in-app purchases. Just do not run out of moves and with a little patient you will never need purchase anything even though complaints have come in saying it is impossible to jump up levels without buying items – Are you having any Farm Heroes Saga problems? If Farm Heroes Saga is down today, then reports will be found below. Good to see on Twitter that Mario Lopez plays this game when training in the gym, good for him because I have not been able to play mine for around 2 days now because it keeps crashing. Having problems loading the game on the last couple of days, get as far as play then bumps me off, anyone else having problems? The problem has been fixed!! There was an update yesterday, and with that, they changed the required carrots from level 1364 to blue instead. Yayee! That’s exactly what I’m trying to figure out. There has never been a level that I couldn’t pass, and I’ve tried everything with Level 1364, but can not figure out how to get the carrots. It’s costing me money and making me mad!! I went to the Farm Heroes website and it doesn’t even have that level on it yet, since it’s so new. I also Google’d it and watched a YouTube video that was supposed to be about that level, but it’s not. If you figure it out, please let me know (by responding to this). THANKS! Level 1364. No carrots?? How do I get carrots???.?.? There is a brand new episode release today, looks like a new map guys and girls. Happy or what? Level 732 should have 3 poppy seeds my game only has 2 so can’t complete the level. The game keeps blinking out towards the end, level 645 just as ur about to win that level!!! U lose that life every time!!! Is there a bug fix? Im on level 712 and I cant load the game, anyone else has experienced that?? What can I do?? Can’t get on either. Wondered if it is because special gifts with additional tasks and as nearly completed i.e. 1 more to finish locked out. Expected to be able to get back on after weekend but still locked out. Help? am on 402 but since yesterday cannot load ????? No problems this week so far, so far so good as they say so i am very happy indeed as i love playing this game in my lunch hour. Here is a top tip so you dont have any problems getting to the next level – It is best to make your matches at the bottom of the board when you can. App keeps crashing on me, I am on level 483. When I try to play on my Android device the app keeps crashing, yet when i play Facebook version its all ok. I am on level 227 and cannot win this, help please. I am stuck on level 869 and can no longer pass this one. How do you get out of this one people. It is basically impossible to climb the higher levels without buying items, this is costing a lot of money. Time to delete I think.